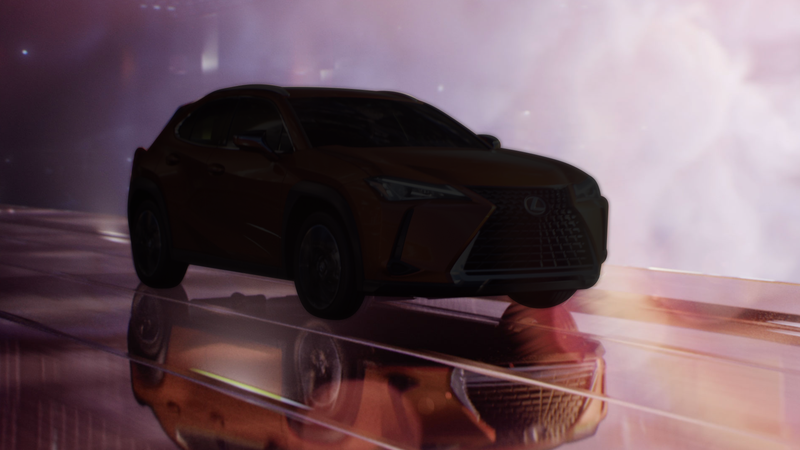 The Lexus UX crossover, which isn’t a performance variant, with a shadow over it. We just needed a photo. Wait, stop what you’re doing for a second. Did you hear that? That train whistle? No, it’s not Thomas, and it’s not the hype train every American is about to hop on for their annual Super Bowl bandwagon. That’s the performance-SUV train, which Lexus is about to join Lamborghini, Ford, Ferrari—well, everybody—on. The whole idea of a Lexus performance SUV is just talk for now, according to Motor1. The website reports that Lexus’ vice president for product planning and strategy, Cooper Ericksen, told reporters before the 24 Hours of Daytona over the weekend that an SUV with Lexus’ F performance badging on it is an “active conversation” at the company. While Chika Kako, executive vice president and chief engineer to the Lexus UX, acknowledged the brand’s smallest crossover “has potential” to join the F family as a high-horsepower gasoline-electric hybrid, Ericksen stated that Lexus continues to evaluate what an F crossover or SUV might emphasize. Although the brand’s crossovers are likely limited to the former line of thought, the body-on-frame Lexus GX and LX models offer the go-anywhere capabilities the F sub-brand needs if it plans to create a high-performance off-road machine. Off-road performance, would, of course, feel more natural. That’s what SUVs, including even the new Rolls-Royce Cullinan, are and have long been made for. Automakers, who are in this to make money, want to milk the SUV craze as much as possible—even in the realm of performance. Ford released an Edge SUV with its ST badge on it, and might go as far as building one with the iconic RS badging. Lamborghini joined in with the Urus. Ferrari has an SUV in the works, but you better not call it that. Aston Martin has a crossover. Bugatti said it won’t make an SUV, but it probably will. They all eventually do. What’s that, you say? You hear something echoing in the distance? It sounds like a whistle—the sharp, piercing whistle of the performance-SUV train, coming to pick up the next automaker to succumb to its power. Surely, though, all of these performance crossovers and SUVs with their eight-speed automatic transmissions will stay true to the deeply rooted performance DNA of their parent brands. Surely.